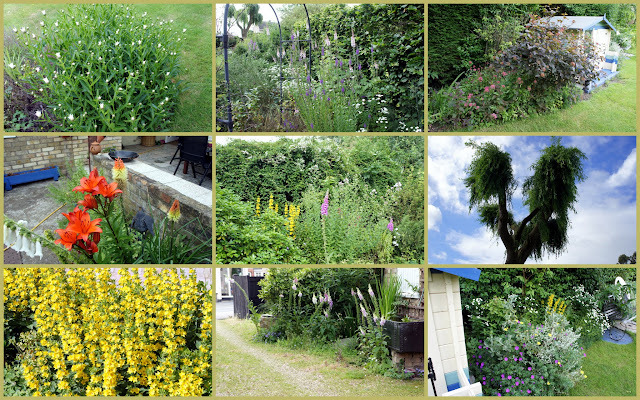 Our garden has been pretty much neglected over the last 5 weeks due to the weather, holidays etc, so the plants have been given their heads and have gone pretty much beserk. Whilst I love the cottage garden look, I do like some kind of order in the borders, but alas there is some major work to be done. Amongst everything are lots of pesky weeds, gone to seed forget-me-nots - you can at least rip all these out and they will just reappear next year. The brooms have finished and gone all leggy, so they will need a haircut and some kind of staking. My main problem is that my garden also harbours an enemy - the mosquito. He ignores Peter but makes a bee-line for me. I am sporting 4 bites just from a walk down to pick some rhubard. I therefore have to dress with not an inch of flesh showing and be liberally sprayed with insect repleant. Not so bad if you plan a day in the garden, but a real pain if you just want to spend a short while out there. Not sure what I can do, but really the garden is a no go area for me, which is such a shame. But then its not like we have had any "sitting in the garden" weather yet! Such beautiful flowers, and some of them my favourites. I just love your foxgloves. It's been a good year for them. 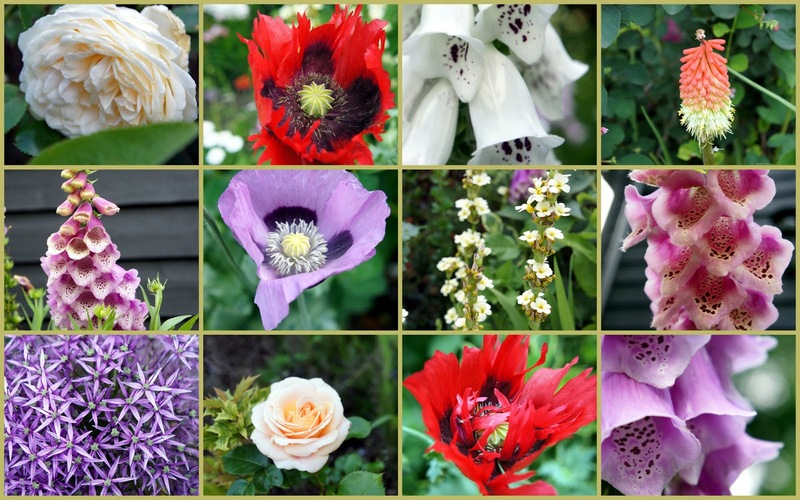 We have many in our garden this year, all self-seeded. And I love your poppies too. 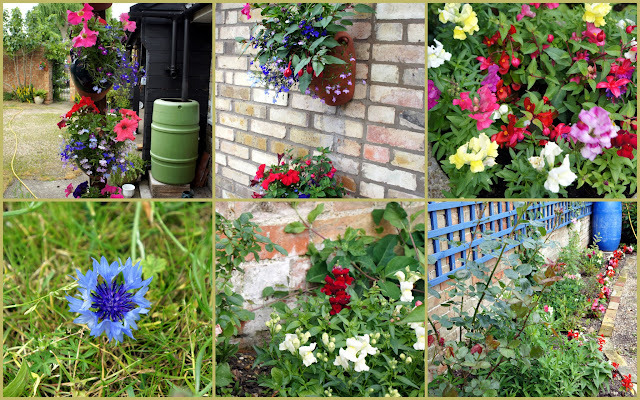 Not many flowers in our garden though, mainly shrubs, trees, fruit bushes, ivy and dandelions. Regarding the mozzies: have you tried carrying a lighted (or should that be lit?) citronella candle? It really is a riot of color! Wonderful flowers, and all so lush and green. Thank you for sharing your garden. 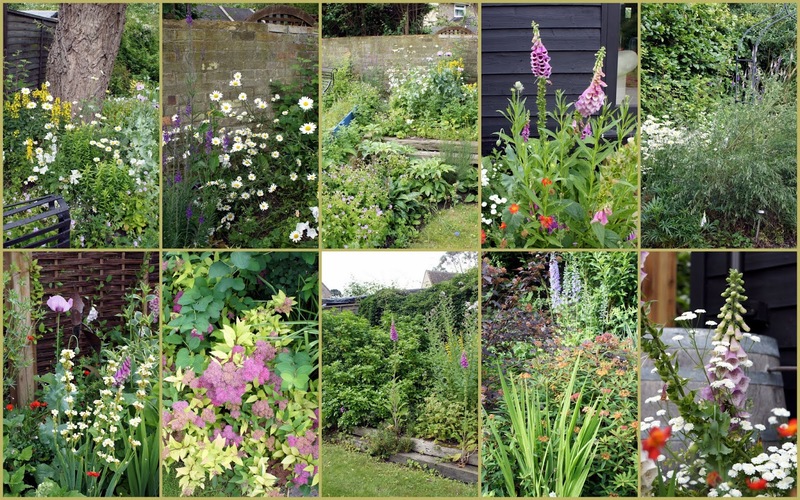 Sue your garden is spectacular in all it's wild goodness! I understand the desire for some sort of order, but I can easily let it go when faced with those blood sucking pests. I say enjoy the beauty for inside - where it's safe! The weeds will be there when the skeeters are gone! Excellent pics as always. Your garden looks like something from a beautiful painting! Have you thought about buying one of those gadgets you set up outside that zap the insects? I have seen them in stores, but haven't tried them myself to know if they work. But it might be worth a try. It is a shame to think you can't enjoy being out in your gorgeous garden. I showed my mother (an avid gardener down on her luck due to changing climate) you photos and she was so impressed and in love with your garden too! I love your photos as always!